This article was brought to you by Gregory, the makers of hiking packs that are tough enough for day hikes, horse trails, and bike paths. Their flexible suspension system lets your body breathe, and smart organizational features make them easy to pack for any kind of camping trip. Horses have been an integral part of how humans have explored, played, and worked in the great outdoors for thousands of years. From the steppes of Mongolia to the Great Plains of the American West, these four-legged friends have literally carried us into unknown landscapes and the places we call home. It was the steady beat of stagecoach teams, wild Mustangs, and steady pack horses that rang out across the early United States from its easternmost point in West Quoddy Head, Maine to its westernmost reach in Cape Alava, Washington. Many roads and trails beloved today by thru-hikers, bikepackers, and off-road enthusiasts began as thoroughfares for foot and horse traffic, like the Natchez Trace. Others are open to any rider prepared to make the trek, like the equestrian-friendly Pacific Crest Trail. And while you’re more likely to see RVs at the campground than horse trailers these days, there are hundreds of horse trails coast to coast where you can still take in the scenery from your saddle. Some states, like Texas, still have a strong horse culture where most state parks like Big Bend State Park, Guadalupe River State Park, and Hill Country State Natural Area feature horse trails and facilities for watering or overnighting horses. Other states like Kentucky and Tennessee give a similar nod to the equestrian history of their states with a few horse-friendly destinations. Some states’ horse-friendly amenities might be more surprising, like Minnesota and Illinois. Others like Wyoming and Colorado never lost their rich cowboy culture. 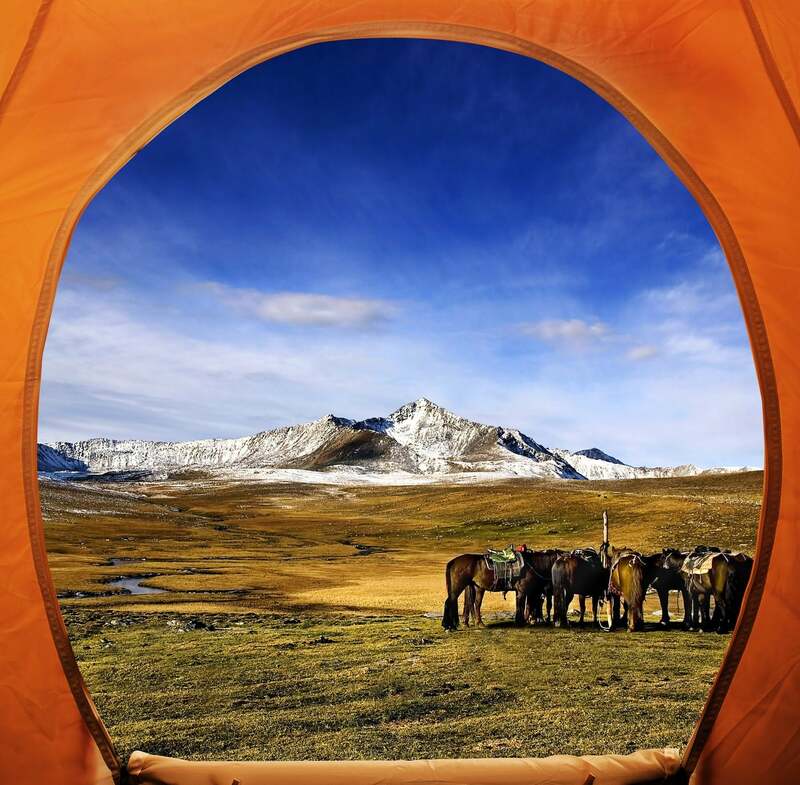 We’ve rounded up some of the best campgrounds near horse trails throughout the United States. If you’re looking to find even more, however, just use the Equestrian filter on The Dyrt when searching for campgrounds. It will narrow your search down to just the sites that are designated as horse camps with special amenities for equestrian campers. Image from The Dyrt camper Krista T.
With wide-open landscapes marked by rolling hills and pretty glades of trees, it’s no wonder the North Star State is so popular with horse enthusiasts. Minnesota’s state parks feature over 1,000 miles of horse trails that cross all kinds of terrain. Crow-Hassan Park Reserve alone has 15 miles of summer trails and 5 miles of winter trails. 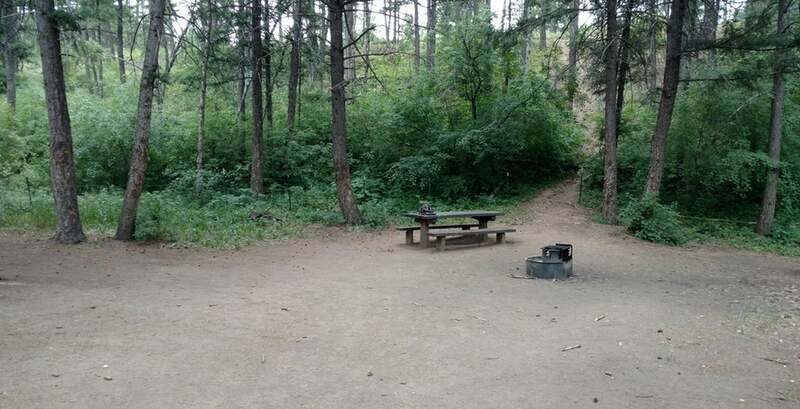 There are also two different spots within the park where you can camp with your horse, with ride-in sites available at Crow-Hassan Park Reserve and Elm Creek Park Reserve. 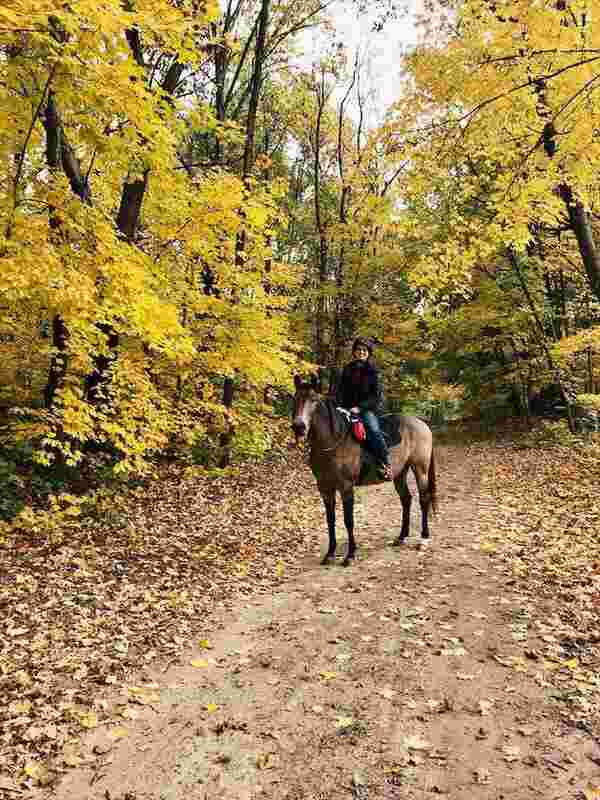 “This is my all-time favorite park to bring my horse to, and it’s her favorite trail too. Seriously, when we head back to our trailer she will stop and refuse to proceed. Do a 180 on the trail and she is happy to trot away from the trailer. Pit toilets are available and there is water available at the entrance off of Park drive, not sure about the other locations.” —The Dyrt camper Krista T.
In many ways, North Dakota is still remarkably the same as it was almost 140 years ago, especially in the national park that now bears Roosevelt’s name. There are about 70 miles of horse trails close to Roundup Group Horse Camp, a campground that can accommodate 20 equestrians and their horses. You can explore the rugged Badlands that shaped both our thirty-second president and the mythology of the American West before bedding down under the stars and plentiful cottonwoods. 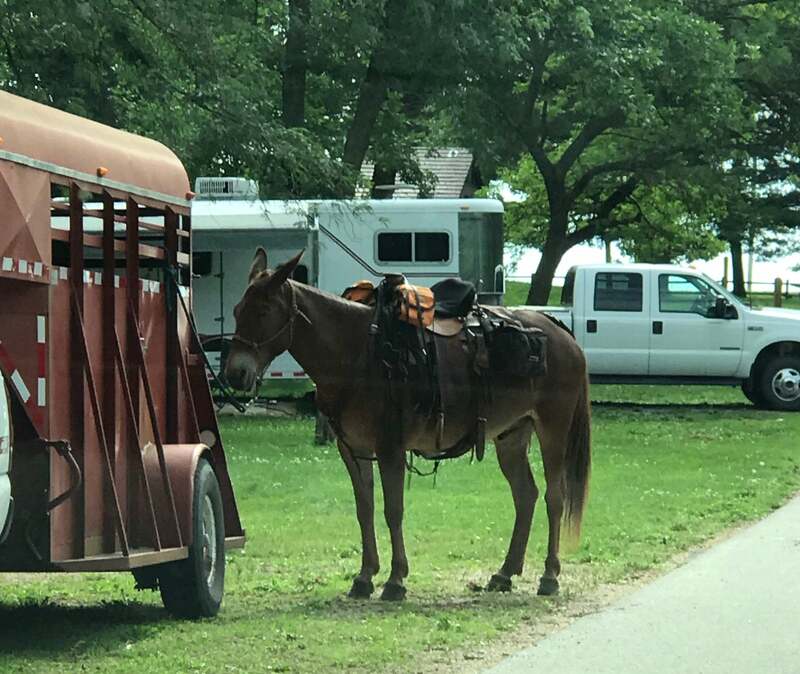 Image from The Dyrt camper Julie C.
There is a lot to recommend in this corner of southwestern Iowa, with a gorgeous lake, hunting and fishing, hiking trails, snowmobile trails in winter, a frisbee golf course, and even a beach for swimming and activities like volleyball. It’s also an ideal destination for horse riders, with miles of horse trails winding through old growth oaks and hickories. It’s easy to make a multi-day excursion out of your visit with 23 equestrian campsites, as well as additional holding stalls and tie outs for day users. All are relatively close to the lake. “Perhaps one of the best parts about the Lake of Three Fires is the 10 miles of trails the intertwine around the entire Lake. There are some specific trails for hiking but some others that offer horseback riders an amazing view of the lake. The great thing about the trails is how they snake around each other- you could discover a new path every time you go.” —The Dyrt camper Kimberly W.
Once home to Wyatt Earp’s older brother, Prescott, Arizona had its role to play in the mythology of the American west. The region is also as rich in geologic features as it is in outlaw history— the stunning Granite Dells are close by, as is Goldwater Lake, the Bradshaw Mountains, and Prescott National Forest. One of the best ways to explore this slice of central Arizona just north of Phoenix is by horseback, the same way Doc Holliday and the Yavapai tribe traveled through these rocky hills and ponderosa pines over the centuries. There are lots of horse trails in the area, including the Balancing Rock Trail #349, the West Lake Trail #351, and the Mint Wash Connector Trail #352. Most have some amenities for horses along the way, often intersecting with various horse camps within Prescott National Forest. By far one of the most popular is the 9.8-mile Groom Creek Loop Trail #307. It’s open to hikers, mountain bikers, and equestrians, and connects to a horse camp of the same name. “Very nice campground but it is dry camping. They have a high line and 1 pen at each site. There are several water faucets for filling but not close to all sites. Nice trail riding. Take note that if you don’t have a horse with you, you will not be able to stay there.” —The Dyrt camper Edward W.
Image from The Dyrt camper Kimberlee M.
Afton, Wyoming is due south of Yellowstone and just over the Idaho border. As you might expect from a town whose claim to fame is the world’s largest arch made of elk antlers, there’s plenty of room to roam. Just 20 miles north of Afton is Allred Flat Campground in the Bridger-Teton National Forest, the third-largest national park outside of Alaska. With 3.4 million acres to explore, it’s easy to find good riding. The horse trails in Bridger-Teton range from easy mile-long beginner stretches to much longer forays into the backcountry in true Cowboy State-style. The Spring Creek trail is especially popular for equestrians. Follow the Little White Creek through stands of pine and aspen trees, where abundant wildlife sightings abound—especially birds and beavers. You can camp at Allred Flat, a popular group site with corrals available for your steed. “The sites are well spread out throughout the campground. They have fire rings, grills, and picnic tables. Pit toilets are available and there is a hand pump water source.” —The Dyrt camper Carrie C.
One of six state parks that feature horse trails in Arkansas, Devil’s Den is a wonderful way to explore the Ozarks. With 20 miles of horse trails to explore and 42 sites with hookups in the horse camp, you and your pony will be very comfortable here. There’s also fishing, boating, ample mountain biking, the 15-mile Butterfield Hiking Trail, and the area’s ample caves and rock formations to keep you entertained, too. “What I liked about this park, besides the great hiking trails, were all of the historic CCC buildings. There is a really neat scenic overlook that was built by the CCC near the Yellow Rock trailhead, and if you step in the visitor’s center, you are actually in the old CCC motor pool.” —The Dyrt Camper Annie C.
Image from The Dyrt camper Natalie B. In 1873, a British world traveler and writer, Isabella Bird, embarked on a 300-mile solo journey on horseback through the magnificent scenery of Colorado. Her account of the trip, A Lady’s Life in the Rocky Mountains, became an instant bestseller as readers around the world clamored for descriptions of the still-new American west. You can see how the views have held up almost a hundred and fifty years later as you ride the Indian Creek Trail, a 14-mile horse trail loop through stands of Ponderosa pines, Gamble oaks, Douglas firs, as well as Colorado’s famous aspens and spruce. In addition to group sites at the campground of the same name there are hitching rails and corrals provided for horses and potable water. “Indian Creek is lush and wooded, while still being close to Denver. The drive in is easy, following a paved road most of the way. Great spot for car camping. The Indian Creek trail system is ideal for mountain biking or running, with access to the Colorado Trail running through it as well.” —The Dyrt camper Steph A. There are several places in Great Smoky Mountains National Park that cater to equestrians, and lots of horse trails to choose from. One of the popular starting points for any overnight riding adventure, though, is Anthony Creek Horse Camp. 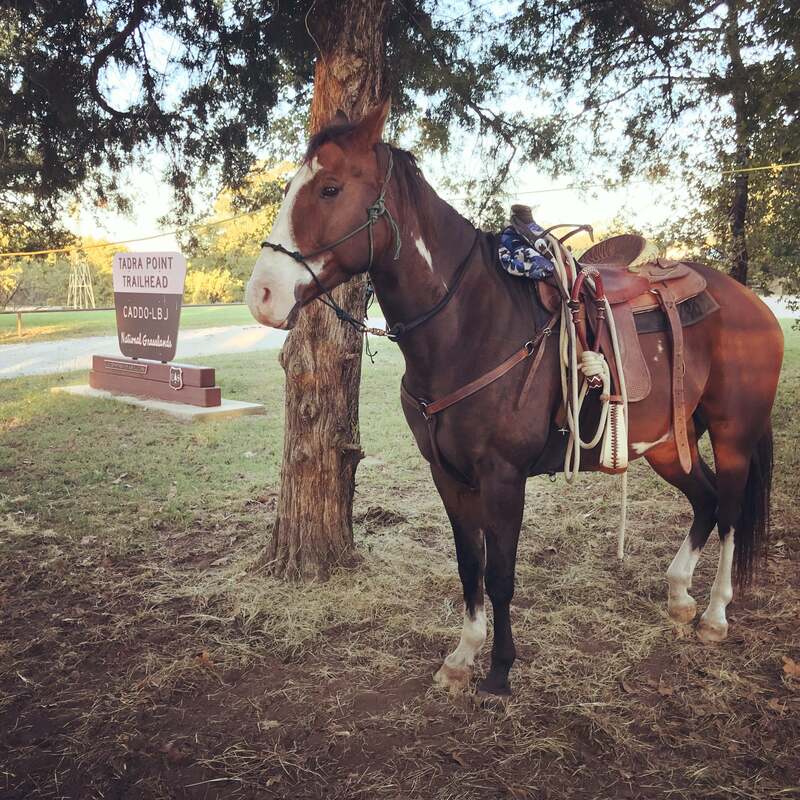 This campground connects you to numerous equestrian trails and has the amenities for your four-legged friend, too. You’ll find the Anthony Creek hiking and horse trail nearby, a 3.5-mile stretch that winds up Bote Mountain from Cades Cove and connects to several other trails. Anthony Creek also gives you access to the Russell Field Trail, Bote Mountain Trail, and Crib Gap Trail which are horse-friendly, as well as the Appalachian Trail, which is open only to hikers. There are 4 horse hitch racks located at each site in Anthony Creek Horse Camp, as well as vault toilets and spigots. There are even more amenities at nearby Cades Cove, too. For those eager to ride but without their own steed, there are nearby horse stables that offer riding tours during the warmer months from March through October. “Great place to camp. Easy access to the trails right from camp….beautiful area. 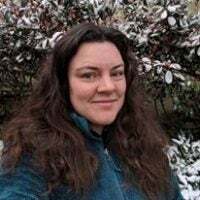 Will be going back for sure.” —The Dyrt camper Robbie S.
Image from The Dyrt camper Leah W.
Right at the corner where Virginia, North Carolina, and Tennessee meet, you’ll find Southern Appalachia at its finest in the George Washington and Jefferson National Forest. 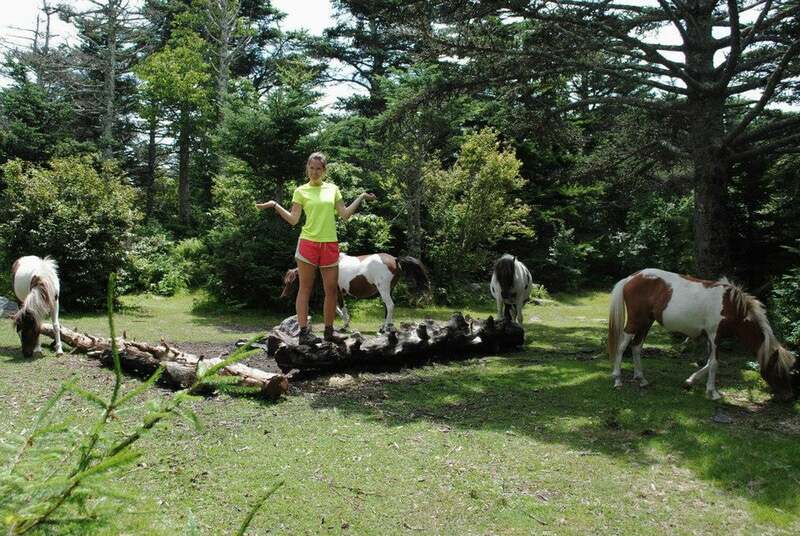 In addition to your own horse, which is welcome at Grayson Highlands, you might also encounter wild ponies. You can explore Virginia’s two highest mountains, and take in stunning alpine views. Like Anthony Creek and Cades Cove further south, you’ll also have access to the Appalachian Trail. As for where to ride near Grayson Highlands, it’s hard to beat the Virginia Highland Horse Trail, a 68-mile loop through the Blue Ridge Mountains with stunning views and intersections with other trails. When your ride is complete, there are stables adjacent to the Chestnut Hollow site within Grayson Highlands. 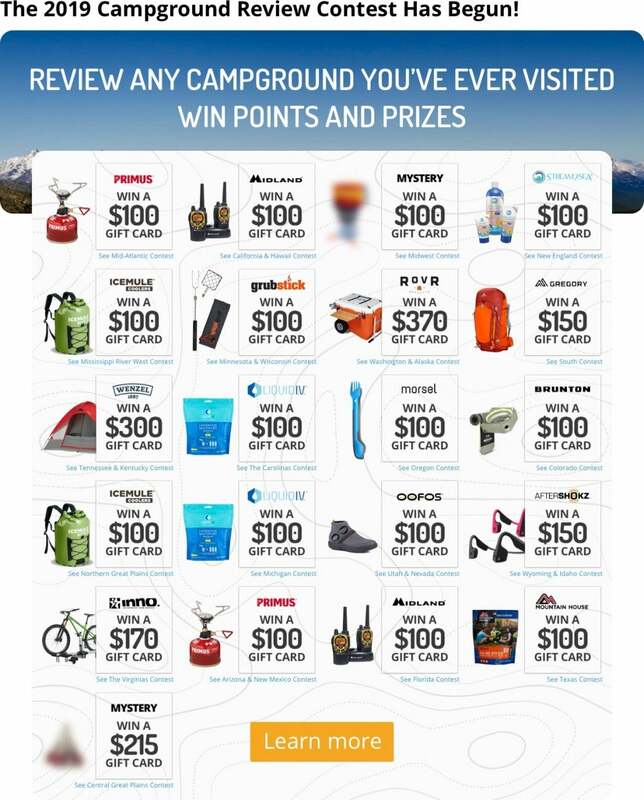 “We love using this campground as our basecamp. You can hike to see wild ponies and hike to blueberry bushes! The campground is clean, offering lots of space for kids to run and play. We enjoy camping on the big field so we have a clearing to see stars at night. 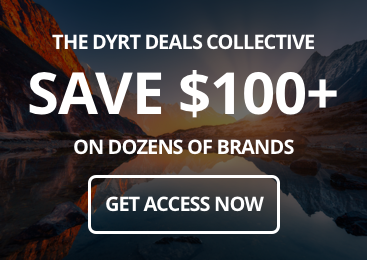 They offer camper hookups and tent camping – composting toilets with sinks are available as well.” —The Dyrt camper Kristen J. Image from The Dyrt camper Michael M.
This sprawling state park has a little something for everyone, from RV sites with full hooks up to tent sites to horse camping. There are a ton of activities you can enjoy in the park, including geocaching, boating, fishing, hunting, swimming, hiking, snowmobiling, and more. In addition to a 15-mile horse trail in the area and even more horse trails in Governor Knowles State Forest, there are nearby stables where you can make arrangements for your own horse or book a riding excursion. “The park is huge and is one of the only state park’s in Illinois with horse camping and horse trails. There are 13 horse camp sites and additional trailer parking for about 6 more rigs with tie out posts for riders that will not be camping. There are several miles of horse trails and the area is set apart from hiking trails and the other camping areas.” —The Dyrt Camper Michael M.
Minnesota might be best known to outdoor enthusiasts for the stunning Boundary Waters, cozy yurts, and winter sports like snowshoeing and cross-country skiing. But it’s also a fantastic destination for horseback riding. 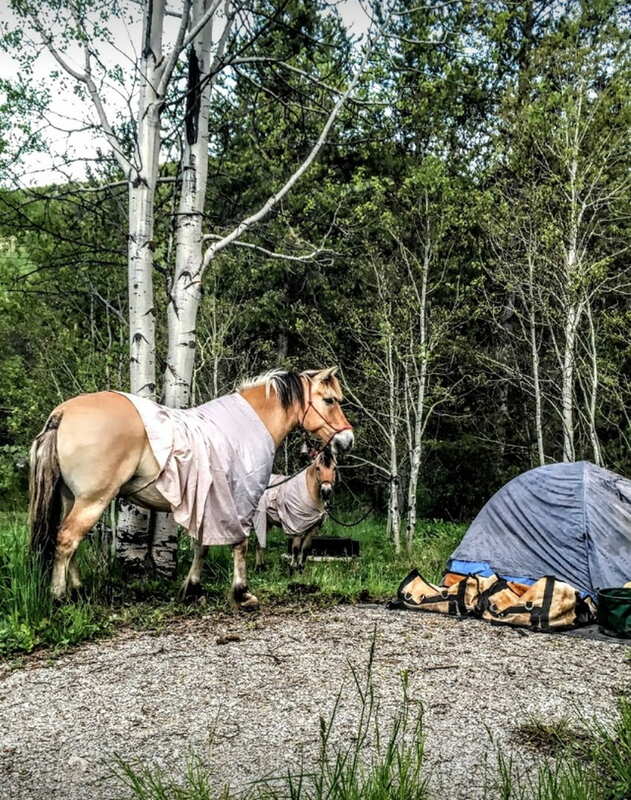 There are over a thousand miles of horse trails in Minnesota alone, as well as several horse-friendly campgrounds at many of the North Star State’s parks. One of the best is Fort Ridgely State Park, where there are 12 miles of horse trails open during the warmer months, after which they convert to snowmobile trails. There is also a 25-site horse campground and plenty of RV and tent sites. Fort Ridgely is also hammock-friendly, if you prefer to sleep off the ground. When you’re not riding, there’s lot to keep you busy. The state park gets its name from the military Fort Ridgely that played a pivotal role in the U.S.-Dakota Conflict of 1862. History buffs will get a lot out of the museum, cemetery, and preserved remnants of the fort. Rangers lead classes on interesting topics like edible plants, maple syrup demonstrations, and more. “We stayed at Ft. Ridgley horse camp. Very nice horse camp, with electric hookups, and water at every site. Bathrooms and showers right in horse camp, and a nice little creek about 50 ft behind our site, that our boys loved playing in!! Nice trails, I wish there were a few more miles, but over all very decent. We had a great time.” —The Dyrt camper Cody T.
Images from The Dyrt campers Kelly S. and Warren K.
If you’ve ever fantasized about the romance of horseback riding on the beach at sunset (or any other time of day), it’s hard to beat Montaña De Oro State Park. This geologic playground is unique amongst other craggy beaches and headlands along the West Coast. Horse trails, like the Dune Trail and Hazard Peak Trail, will carry you along the bluffs through groves of fragrant eucalyptus trees. In this one state park there are 3 horse campsites, 2 group horse campsites, and horse trailer parking off Pecho Valley Road. The first horse is included in the price of the campsite and additional horses up to a maximum of 6 are $2 each per night. 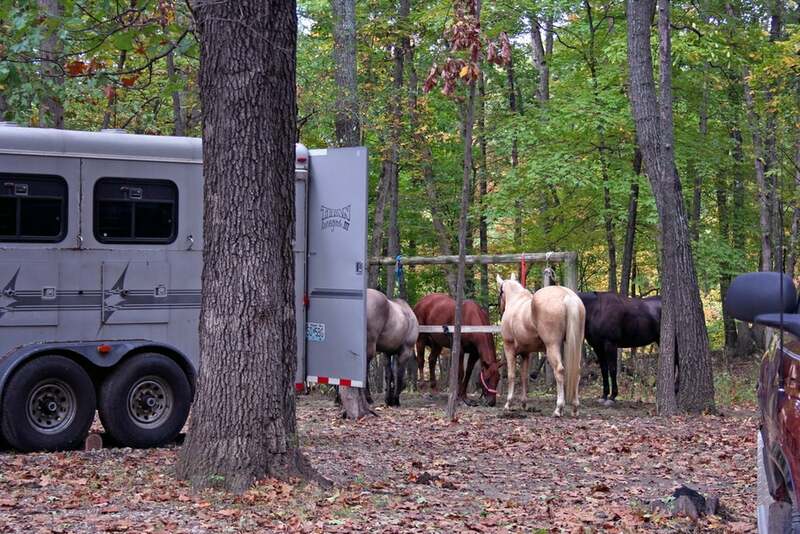 Each of the group sites fits up to 50 people and 20 vehicles, with a minimum of 7 horses required to reserve. “This campground is quiet and super spacious compared to other campsites. It’s a short distance/walk to the beach, a hike, horseback riding and biking. Its beautiful! 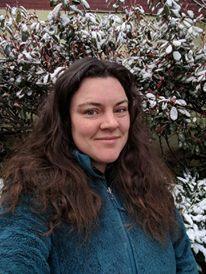 My family and I have been visiting this campsite for years and we love it.” —The Dyrt camper Aimee M.
There are many great horse trails and equestrian campsites in the Pacific Northwest, but we at The Dyrt have a certain affection for the Cow Camp Horse Camp at Sisters in Oregon — partly for its name. It also has a stamp of approval from the Central Oregon Chapter of Oregon Equestrian Trails, which helps to fund and manage the campground. The horse camp aspect of this site is clear cut enough—it features five sites and serves as a basecamp for the Metolius Windigo Trail, an epic 100-mile horse trail that runs from the Mt. Jefferson Wilderness west of Sisters to Windigo Pass south of Crescent Lake. The cow camp part is less clear, however, as there aren’t exactly a lot of cattle drives passing through the Deschutes National Forest these days. Nevertheless, it’s hard to beat free camping with corrals and other amenities for your hay-loving friends. “The campground is about 5 miles away from the town of Sisters and so remote and beautiful. There are only 5 spots and a beautiful pond.” —The Dyrt camper Kayko S.
Image from The Dyrt camper Emily T.
President Johnson backed that statement by signing 300 conservation bills during his time in office. Like many country Texans, Johnson was a consummate horseman. You can celebrate his legacy of environmentalism from the saddle at the Lyndon B. Johnson National Grassland. It sits on the plains of North Texas across the river from the ranch where Johnson grew up, about an hour from Fort Worth. Pack a lunch in your hiking pack and an apple or two for your Mr. Ed. There are 75 miles of mixed-use and horse trails, as well as 20 parking spurs, 6 pull-throughs and 10 stock tethers. There’s a lot to do besides riding out from TADRA Point where the LBJ trail system begins. The Grassland includes a 100-year-old living farm, nearby vineyards, as well as a boat ramp, hunting, archery, and more. “This campground is great for hitching up a high line for your ponies and spending the weekend hitting the trails. You’ll have to haul water to your site from the water trough.” —The Dyrt ranger Emily T.
Close to the confluence of the Georgia, North Carolina, and South Carolina lines, Whetstone Horse Camp sits in the middle of the Andrew Pickens Ranger District. There is a lot to explore here, in the prime southern Appalachian wilderness where the Chattahoochee and Nantahala Forests blend together. While the area’s proximity to the Appalachian Trail often draws a hiking crowd, there’s a lot of great horse trails to enjoy, too. There are several major equestrian trails close by. One is the nine-mile loop called the Woods Ferry Horse Trail, which runs through the red clay and pine hardwood forests as the region’s mountain rangers fade into hilly Piedmont countryside. The other is the big 31.5-mile Bumcombe Horse Trail network, which gives riders lots of variety as you weave through wildflower meadows, stands of trees, and past old plantation houses and hidden little Southern-style family cemeteries. The Rocky Gap Trail and the Willis Knob Horse Trails show off a different side of the South Carolina landscape, running along the edge of the Blue Ridge Mountains and into the Chattooga Wild and Scenic River corridor. Whetstone Horse Camp is home base for both of these trails, which run 12.5 and 15 miles, respectively. However, nearby Willis Knob Horse Camp is another great option, too. “Trails were clean although a little to narrow in some spots, especially when needing to pass another horse and rider but there is plenty of wide open areas that allow for the perfect opportunity to stop and rest.” —The Dyrt camper Maddi P.
This post was brought to you by our pals at Gregory. Check out Gregory’s selection of hiking backpacks that will carry you from beginner trails to bucket list peaks.